No other composer enjoyed as unanimously high a reputation across Europe during his lifetime as Johann Adolf Hasse. Bourgeois opera audiences worshipped him as fervently as crowned heads in Vienna, Dresden, Naples, Paris, London and Berlin. His music dissolved national frontiers and spanned two generations; the ink was still wet on the Brandenburg Concerti of Johann Sebastian Bach as Hasse celebrated his first triumphs in Italy and by the time he put down his pen a young Wolfgang Mozart had taken up residence in Vienna. Hasse's success was based upon his skill in writing for the voice: bel canto was for him the sine qua non of great music and to the beautiful display of lyric melody all else was subordinated. Only recently has he begun to be recognised as a founder of the Classical style, a reaction against the complexities of the seventeenth century. Schiebe writing in his Critischer Musikus of 1745 realised this despite eliminating its Italian origins! "There have already been mentioned two men how have brought fame to our fatherland at this time, in respect to bringing music to its highest point. Hasse and Graun are these excellent men. And one can say truthfully that these are the ones that have begun, as it were, a new period of music. They have shown us the beauty of good taste in such a way, that we can clearly recognise in their works, with what diligence they have followed in the footsteps of those who in so many ways had gone before, and that they truly have reached the ultimate goal that was the object of all endeavours of their predecessors, to follow nature, to imitate it; and [other] Germans follow their example"
Hasse's life and travels are signposted by opera seria productions in all the major cities across Europe, yet he also composed music in other genres including 80 flute concerti for one of his most ardent admirers Frederick II of Prussia. Frederick II's armies bombardment of Dresden in 1760 destroyed not only the whole Pirna suburb, the Saxon State library and the Kreuzkirche but also Hasse's house along with all the manuscripts it contained in readiness for the publication, sponsored by the Elector, by Breitkopf of Leipzig of the first "complete edition" by any composer. Though copies of his most important works did exist a great number undoubtedly perished creating many questions for todays musicologists. Burney visited Hasse in Vienna in 1772 and when he respectfully asked the venerable master for a list of his works, Hasse was obliged to admit that he had forgotten them. 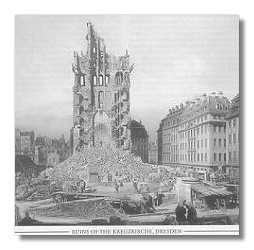 "He modestly compared himself to animals of the greatest fecundity, whose progeny were either destroyed during infancy, or abandoned to chance; and added that he, like other bad fathers, had more pleasure in producing than preserving his offspring"
It is clear that despite the bombardment of Dresden by Frederick's armies and the Allied bombing in the Second World War there still remains a vast amount of Hasse's music; 63 operas, a dozen oratorios, some 20 masses and requiems, 90 cantatas and hundreds of other works. A search of the RISM database reveals 1635 entries! As 1999 is the tercentenary of Hasse's birth we can only hope that this will mean that record companies and performers will provide us with more chances to hear the music of this remarkable composer – whose maxim "Let music be clear, simple, but sublime" stretches out to us across time. Johann Adolf Hasse was born into a musical family on the 23rd or 24th March 1699 in the small village of Bergedorf near Hamburg in the region of Germany known as Lower Saxony. His great grandfather Peter Hasse had held the position of organist at the Marienkirche in Lübeck and had gained some fame as a composer. Johann's grandfather, father and brother successively held the position of organist at Bergedorf. Due to family connections his father was administrator of a local charity intended for the poor of Bergedorf and it was this same charity which was to enable an already promising fifteen year old to travel to Hamburg to study voice between 1714 and 1717. In 1718 upon the recommendation of Johann Ulrich König, at that time private secretary and poet to the Saxon Court at Dresden, he was hired as a tenor with the Hamburg opera company. Unfortunately Hasse never met the then director of the opera, Richard Keiser although his involvement in performances of his music must have formative influence. It was also König who recommended Hasse for his next position as tenor at the Duke of Brunswick's Wolfenbuttel opera where he sang in operas by Schürmann, Conti and Caldara. The highlight of this period, from Hasse's viewpoint, took place in the summer of 1721 with the performance of his first opera, 'Antioco' in which he also took the title role whilst Schürmann sang the role of Seleuco. "He studied at first a little while under Porpora, as I had been told before by Barbella; but Hasse denied that it was Porpora who introduced him to old Scarlatti. He says, that the first time Scarlatti saw him, he luckily conceived such an affection for him that he ever after treated him with the kindness of a father. " Hasse also helped J. J. Quantz to obtain a position as a student of Scarlatti. Quantz in his autobiographical sketch entitled 'The Life of J.J. Quantz described by himself' which appeared in Marpurg's Historical and Critical Essays on Music in 1755 also says that in 1725 Hasse received a commission from a banker for a serenata for two voices. This piece entitled Antonio e Cleopatra was performed by two of the most famous singers of the day; Carlo Broschi, better known as Farinelli and Vitoria Tesi. 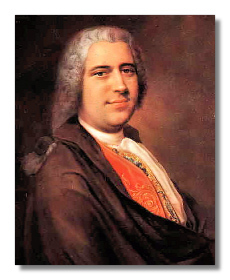 Quantz goes on to say that this work was responsible for Hasse being commissioned to compose an opera for the Neapolitan court at that time ruled by the Holy Roman Emperor Charles VI. Antonio e Cleopatra can be said to mark the end of his apprenticeship, his acceptance by the Neapolitan court and the commencement of an international career which was to span the next 57 years. Sesostrate was the first of Hasse's seven operas for the royal opera within the space of six years which is in itself an astonishing achievement. 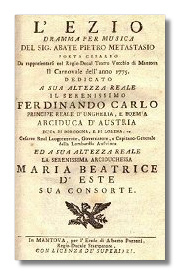 Sesostrate was performed in the Teatro San Bartolomeo on the 9th birthday of the Princess Maria Theresa on 13th May 1726. Interestingly the libretto names Hasse as maestro di capella to the Duke of Brunswick so presumably he was in Italy at that courts expense and it is not until his opera Tigrane in 1729 that he is described as maestro sopranumerario della Real Capella di Napoli. By 1730 Hasse's fame had spread far beyond Naples and the invitation to produce his first opera in Venice was to provide the circumstances which would change his life forever. Whilst no one could contest that Neapolitan opera was the most stylish in Italy the opportunities for an emerging composer that Venice provided due to the sheer quantity of public supported opera productions and the four ospedali were immense. An invitation to produce an opera during Carnival season indicated that he had joined the ranks of Scarlatti, Porpora, Leo and Vinci, who at that time was the most successful composer of opera seria. Surely it is no coincidence that Porpora, Leo and Vinci had all trained in Neapolitan conservatories. The opera in question, Artaserse was presented in the S Giovanni Grisostomo Theatre and was based upon a text by Metastasio which had been modified by Giovanni Boldoni. This opera included two of the most famous arias of the 18th century; Pallida il sole and Parto qual pastorello. In the same Carnival season this opera had already been given by Vinci using Metastasio's text unchanged which signifies that this was the authorised version. Whilst in Venice Hasse met and married the renowned soprano Faustina Bordoni around 25th June 1730. Charles Burney in his General History of Music 1776 wrote "She in a manner invented a new kind of singing, by running divisions with a neatness and velocity which astonished all who heard her." Their marriage proved to be a long and by all accounts a happy one and they had three children, Maria (Peppina), Cristina and Francesco Maria. As with Lotti, Heinichen and Veracini before him the services of Hasse and his wife Faustina Bordoni were secured for the Dresden court in Venice. Count Villio, the Saxon ambassador to Venice had been seeking out and training young Italian singers to be hired for the new opera company being organised in Dresden, the previous opera company having being dissolved in 1720. Whilst Augustus the Strong was the current Elector of Saxony it is believed that his son, the Electoral Prince who was to succeed his father in 1733, provided the impetus for the new opera company. The young prince had known Faustina Bordoni since his visit to Venice in 1716 when she had performed in Pollaroli's Ariodante which was dedicated to him. From the libretti of Dalisa (May 1730 Venice) and Arminio (August 1730 Milan) we find Hasse being identified for the first time as 'Primo maestro di capella di S. M. Re Augusto di Polonia ed Elettore di Sassonia'. The position of Kapellmeister at Dresden had remained vacant since the death Johann David Heinichen in 1729 and in Hasse the prince now had an artist of European repute who was uniquely qualified to satisfy his appetite for opera in the latest Italian style! Although written over two decades later in 1754 Jean-Jacques Rousseau's famous passage from his Dictionnaire de Musique emphasizes the mouth watering combination of Hasse and the Dresden Hofkapelle. "The greatest orchestra in Europe, as far as the number and intelligence of its performers is concerned, is that of Naples; but that which is the best distributed and forms the most nearly perfect ensemble is the orchestra of the opera of the King of Poland at Dresden directed by the famous Hasse." 1. Harpsichord of the maestro di capella. d. A platform at each side, for the timpani and trumpets. He was not however given this appointment immediately as it was perceived that Augustus the Strong's life was drawing to a close after which all court officials would be dismissed as a matter of course. Dismissing a master such as Hasse even if a formality would have been far more risky than keeping him waiting and not issuing a decree confirming his appointment in the meantime. Officially Hasse entered the service of the Saxon Court on 1st December 1733 on quite exceptional terms in that he was exempted from accompanying the Elector on his visits to Warsaw. This allowed the Hasse's to continue their respective careers in Italy and elsewhere. "In his last years Bach esteemed highly the former Imperial Oberkapellmeister Fux, Handel, Caldara, Reinhard Keiser, Hasse, both Grauns, Telemann, Zelenka, Benda, and in general everything worthy of esteem in Berlin and Dresden. The first four he did not know personally, but the others he did". "In Dresden, at the time that Hasse was maestro di capella, the orchestra and opera were quite brilliant and excellent. Bach had, even in his earlier years, many acquaintances there, all of whom honoured him. Also Hasse, with his wife, the celebrated Faustina, had come often to Leipzig and admired his great talents. He was therefore always received in an especially respectful manner at Dresden, and often went there to hear the opera. His eldest son usually accompanied him. A few days before he left, he would say in joke, Friedemann, shall we not go again to hear the lovely little Dresden songs?'. As innocent as this joke is in itself, I am convinced that Bach would not have said it to anybody except his son, who, at that time, already knew what is great in art and what is pretty and pleasant"
On 7th Oct 1731 Hasse directed his cantata La gloria Sassonia in honour of the Crown Prince's birthday and the next day left for Italy and premieres in Turin, Rome, Venice and Naples. In 1733 his opera Siroe was premiered in Bologna on 2nd May with Farinelli and Tesi in the title roles and was repeated an impressive 25 times until 21st June. On 1st February 1733 Augustus the Strong died and during the five month mourning period Hasse probably began his connection with the Ospedali degli Incurabili. With the accession of Friedrich Augustus II the musical activity of the court increased significantly and Count Villio received instructions to notify Hasse and Faustina Bordoni to be in Dresden by the end of 1733. It wasn't until 7th Jan 1734 after the birth of their second child that they left Venice and upon his arrival in Dresden Hasse immediately began preparations for an opera and on 8th July 1734 a revised version of Cajo Fabrizio was produced with Faustina Bordoni singing the role of Sestria. On 3rd November 1734 the court departed for Warsaw and so the Hasse's were free to do as they wished until the court returned 18 months later. They returned to Venice and rented a house at the calle grande o di C'a Zen in 1735 and 1736. Hasse wrote a Salve Regina for the Incurabili and in 1735 Tito Vespasiano was commissioned for the opening of the Teatro Pubblico del Sole in Pearo. For Carnival in 1736 at the Teatro San Giovanni Grisostomo Hasse presented Alessandro nell' Indie. 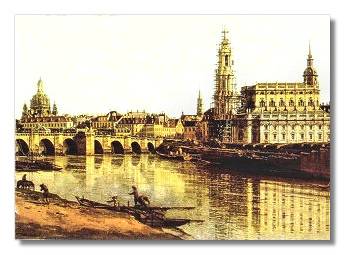 Hasse returned to Dresden in January 1737 and Senocrita was produced for the first Carnival Friedrich Augustus had spent in Dresden since his accession. This was also the first of Hasse's operas to text by the court poet Stefano Benedetto Pallavicino, son of the composer Carlo Pallavicino. On the 26th July the name day of Czarina Anna of Russia (a niece of Peter the Great she was to become Empress in 1730) Hasse's second opera of the season Atalanta was performed. This work was apparently written in thirty seven days as a letter from Count Bruhl requesting a quelque petite operette for the occasion has been discovered dated 17th June. On the 3rd August the third new opera Asteria in honour of the name-day of the King was performed. For the 1738 Carnival season Hasse revised Tito Vespasiano for performance on the 17th January quickly followed by a new opera Irene based upon a libretto by Pallavicino and performed on the 8th February the birthday of the Czarina Anna. On 9th May Princess Maria Amalia, Friederich Augustus II daughter married Charles, King of the Two Sicilies later to become Charles III of Spain which was celebrated by the opera Alfonso. The Dresden opera house was rebuilt and redecorated for this lavish production which included the Kings own Life-Guard in the battle scenes! In September the court travelled to Poland and Hasse and Faustina returned to Venice. The annual cycle of one or two operas in Carnival followed by an opera for the Kings name day was becoming established. On 17th January 1742 Frederick II of Prussia visited Dresden to sign a treaty giving him control of Silesia and witnessed a production of Hasse's Lucio Papirio and immediately became an ardent admirer of Hasse's music. Productions of Hasse's operas took place in Potsdam and Berlin until Fredericks death in 1786! In 1744 Hasse was honoured with producing the first settings of two libretti by Metastasio. From this time Hasse settings of Metastasian texts became synonymous with opera seria. The first Antigono was commissioned for Hasse by the Electoral Court and was repeated fourteen times.The second, Ipermestra was presented in Vienna for the marriage of Maria Anna of Austria to Charles Alexander of Lorraine. In 1745 following the Second Silesian War Frederick II entered Dresden on 18th December with all the prestige of a conqueror to negotiate the Treaty of Dresden. He ordered a performance of Arminio the following day and Hasse and Faustina were asked to give chamber concerts every night of his nine day stay. 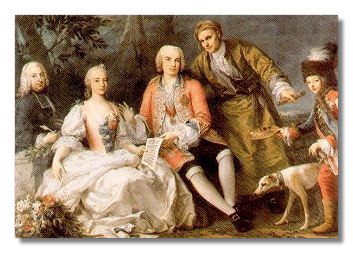 In January 1746 Friederich Augustus II returned from Prague but no Carnival opera was given and Hasse travelled back to Italy via the Electoral Bavarian Court in Munich where he met Princess Maria Antonia Walpurgis, elder sister of the Elector of Bavaria and soon to be married to the Electoral Prince Friedrich Christian of Saxony. The double wedding on 13th June 1747 between Friedrich Christian and Maria Antonia and the Saxon Princess Maria Anna and Bavarian Elector Maximilian Joseph was the largest event in Dresden since Friedrich August II's wedding to Maria Josepha in 1719. The celebrations lasted almost a month and included on June 13th an extraordinary production of Hasse's opera La Spartana generosa, with decor by Giuseppe Bibiena, ballets by the young Noverre and the sopranos Faustina Bordoni and Rosa Negri, the castrati Carestini and Bindi and the tenor Amorevoli. On the 20th Maria Antonia made her state entry into Dresden and a week later the entire court moved to the country chateau at Pillnitz where a series of fêtes champêtre were staged, with music provided by court composer Schurer and Gluck. Maria Antonia brought Nicolo Porpora to Dresden as her singing teacher and on 18th July Hasse directed an opera by another composer, Porpora's Filandro for the first time in the court theatre. This production was a double first as it was also the first time that Faustina Bordoni was not prima donna! The impetus for these changes surely came from Maria Antonia who had great artistic pretensions. She took lessons in painting from Raphael Mengs, her poetry was edited by Metastasio, Hasse instructed her in composition, Porpora in singing and she even learnt the lute from Sylvius Leopold Weiss. Porpora's appointment as maestro di cappella in April 1748 surely prompted Hasse's promotion to OberKapellmeister in 1750. In 1751 Faustina Bordoni retired from the stage and retained her salary of 3000 thaler per year and Hasse remained in Dresden after the Carnival season as a Mass in D minor and a Te Deum were performed on 29th June to celebrate the dedication of the new Hofkirche by Gaetano Chiaveri. The Hofkirche organ was the last instrument designed by Silbermann who died in 1753. Hasse's new work for 1753 Solimano was first performed on 5th February with the now customary crescendo of opulence. At the twelfth performance court ladies were still hiring Swiss Guards to keep their places at the theatre to watch the elephants and camels in the Turkish triumph and to marvel as Giuseppe Bibiena's last scene of the Turkish camp by the Tigris at night, with ships sailing in the river and the gardens of Babylon hanging dizzily in the distance. Perhaps the 1755 production of Ezio surpassed even this with the great scenic designer Servandoni travelling from Paris to stage the production. It included 8000 lamps and candles carried by 250 supernumerary actors and the triumphal entry of Ezio in Act III took twenty five minutes to pass on the stage and included four hundred soldiers, more than one hundred horses, five wagons, eight mules and eight Bactrian camels. The closing ballet with music by Schurer and choreography by Pitrot included 300 dancers and lasted forty five minutes. In 1756 whilst preparations were underway for the autumn opera in Hubertsburg the Seven Years War started. On September 9th Frederick II's armies occupied Dresden and in little over a month had defeated the Saxon army at Pirna. Hasse and Faustina, who enjoyed good relations with Frederick performed for him during his stay in Dresden until his own maestro di capella, Georg Benda, who previously had served at the Dresden court arrived from Berlin. They were then given permission to leave and travelled to Italy. Although Hasse was to produce operas for the court in exile in Warsaw and even present one more in Dresden the Age of Hasse was drawing to a close. When Friedrich Augustus II died of a stroke on 5th October 1763 on the way to a dress rehearsal of Hasse's Leucippo the Augustan Age and the Age of Hasse had clearly come to an end. Friedrich Christian inherited a Saxony severely ravaged by war and economically drained by the expenses incurred in the production of opera seria. Due to the enormous expenses attributable to Court opera we find that productions in Naples, Vienna and Berlin would all be severely reduced in the coming years. On 7th October Hasse and Faustina were released without pension by Friedrich Christian whose reign was notably brief, he died of smallpox on the 17th December. Hasse remained in Dresden until February 1764 conducting the funeral services to their completion and then travelled to Vienna where he was given a warm reception. "Tonight is Hasse's opera; since however Papa is not going out, I cannot see it. Luckily, I know almost all the arias by heart, and thus I can stay at home and see and hear it in my mind…"
"Le me live, and one day I will offer to her [the queen ] a gift worthy of her and of you [ the Genius of Music]; because with your help, I will equal the glory of all the great men of my country, I will become as immortal as Handel and Hasse, and my name will be as famous as that of [ Johann Christian ] Bach." In 1772 Hasse had decided to retire to Venice and he moved there in April 1773 and led a quiet life with his wife and daughter teaching and composing cantatas and religious music. Faustina Bordoni died on 4th November 1781 and Hasse survived her by just over two years. His last composition was a large scale Mass in G minor written in 1783 the same year as Mozart's C Minor Mass. Hasse died of "chest inflammation" brought on by a severe attack of gout on 16th December 1783. "Johann Hasse moved to Naples in 1722, to study and perfect himself in the art of counterpoint under the direction of the famous Alessandro Scarlatti. It is not necessary for me to extol [him] with my words here in order to extract some profit from it, because although he was young at his first entry [into musical life ], in a short time he was known, distinguished, and admired by all of Europe. Because of the marvellous production of this so distinguished artist, and after having written with repeated approbation different works in the greatest and most diverse theatres of Italy he entered the service of the Royal and Electoral Court of Saxony, where for many years he wrote much beautiful church music, and operas for that theatre, where to satisfy the exacting taste of those rulers, he was required to produce ever newer and finer compositions." "It is time, many teachers have decided, that this great man give to the public, by means of the press, if not all, at least part of his so greatly applauded works, which serve as models and instruction for young students." "He perhaps too modest, has until now never wished to yield to the petitions of others, and to this date the desires of the musical connoisseurs have remained unsatisfied. When he entered, as mentioned above, the Electoral service, he did not forego, every few years, travelling to Italy, where he wrote operatic works, always well received and applauded. His great fame resulted in his being invited to Paris, under the rule of Louis XV, King of France, as well as to Berlin, under Frederick II, King of Prussia, where he had an equal success, and received universal admiration. Also, the Imperial Court at Vienna gave him many distinctions and benefits, and in these last years the Invincible Empress Maria Theresa, gloriously reigning, is served by this master in the most luminous occasions of the various marriages of the Imperial Family." "The prime of this great man is past, but yet one notices that all times and in all places he has been appreciated as his merit deserved, and he now lives quietly in Venice, covered in glory, and singled out by all teachers as the Father of Music". This series of pages are dedicated to the work of Frederick L. Millner without whom these pages would not have been possible. ~ Copyright © 1996-2000, David Charlton. If you have any comments, additions or questions I would be really pleased to hear from you!